Fish-and-chips; Scotch egg (hard-boiled, wrapped in sausage, and deep-fried); corned-beef sandwich; English Bulldog (split sausage stuffed with mashed potatoes, bacon and Irish Cheddar); Guinness, Harp, and Bass beers, as well as other spirits. 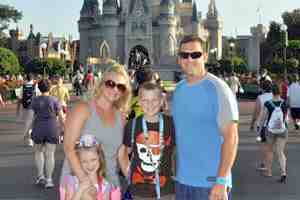 The attractions here are the pub atmosphere and the draft beer. Outside the pub is Yorkshire County Fish Shop, which serves food to go. 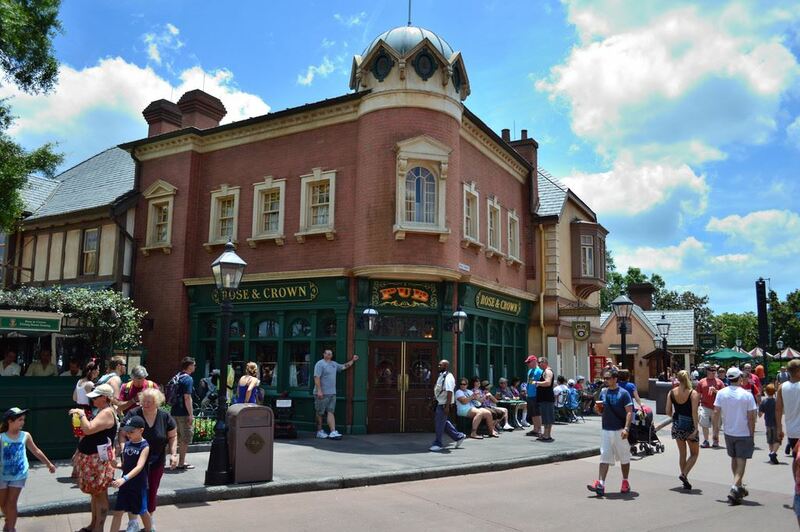 Also see the full-service restaurant profile for the Rose & Crown Dining Room. 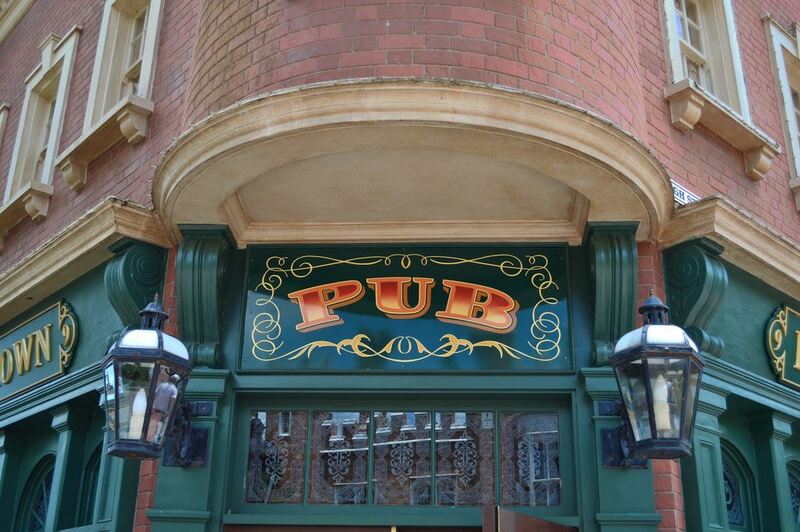 It would hard to conceive of a United Kingdom pavilion in Epcot without an English pub. Luckily, such a chilling scenario never has to be imagined since the Rose & Crown Pub is found right where it should be. On the waterfront side of the promenade that cuts straight through this pavilion, the pub is both a bar and a restaurant and a staple of both British and Epcot life. The word pub itself is shortened from public house. These served as meeting places where townsfolk could hear all of the news and gossip of the town. In time (okay, probably immediately after opening), they became places where alcohol was served. Outdoor signs were not found at public houses until 1393, when they were mandated by King Richard II to make it easier for inspectors and tax collectors to find them. The signs were almost always pictorial since illiteracy was common in 14th century England. The Rose & Crown sign, although considerably more modern than 1393, bears this out. While you are still outside, take a look at the building. You may not notice at first glance, but the exterior actually represents four different styles of pub architecture found throughout England. The most noticeable of them is the classic Victorian (late 19th century) city pub common in central London which is seen around the main door into the bar. The corner entrance flanked by heavily windowed green wood is as traditional as a pub gets. To the right of the entrance (going toward the fish and chips shop), the building becomes a country village pub. A whitewashed ground floor with hanging plants seems very inviting and the quinoid corners and bay window on the upper floor lend architectural interest. Around the back you will find the other two design styles, starting on the side towards Canada (the pavilion, not the country...well, actually both). The facade near the entrance to the restaurant depicts a facade with many elements of Tudor architecture, specifically the halftimbering. Making up the remainder of the rear of the building is a simple stone facade that brings to mind the riverfront pubs of the Cotswolds, which is small set of quaint villages including Stratfordupon- Avon, the birthplace of William Shakespeare. While we’re along the waterfront, both in terms of figurative architecture and in terms of literally being next to the lagoon, take a gander down into the water. There’s a very short canal built next to the Rose & Crown, much like the narrow canals that line southern England. At one point, this canal was fitted with replica locks at each end (and the mountings can still be seen), but the locks are sadly no longer present. Now, after all that, you are probably in need of a drink so we should head inside. The first thing you see when you open the pub door is the Rose and Crown’s wonderfully typical curved wooden bar that dominates the room. The frosted glass on the upper portion, and the carved details, are heavily Victorian, just like the exterior. The adjacent Rose and Crown restaurant has three dining rooms. Take a walk through them and you’ll notice distinct interior decoration in each. These styles correspond exactly with the exterior of each room. Near the bar is the Victorian area with its fancy mirrors, next is the wood paneled Tudor section, and last is the homey, simple, wallpapered riverside room. Beer is definitely the specialty at the Rose & Crown, even though the selection sadly does not include many beers that are from the United Kingdom. Their draught beers are Bass Ale (Engl ish) , Boddington’s Ale (Engl ish) , Strongbow Hard Cider (English), Guinness Stout (Irish, not in UK), Harp Lager (Irish again), Stella Artois (Belgian...really?). There are no draught beers from Wales, Scotland, or Northern Ireland - which represent the rest of the UK - although there are good beers from each. 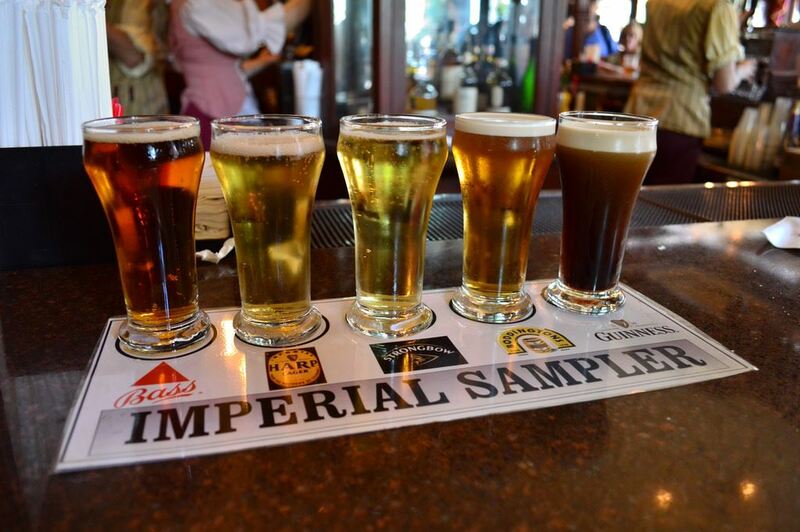 Along with those draught beers, there are samplers available, as well as special beer mixes. These mixes are possible because each beer (especially Guinness and Boddington’s) has a slightly different density, meaning certain beers will “float” on top of another beer. Classic mixes available here are the Half & Half (Harp and Guinness), Black & Tan (Bass and Guinness), Bumblebee (Boddington’s and Guinness), and Golden Fox (Boddington’s and Bass). If you’re not a beer lover, the Shandy (Sprite and Bass) or the Snake Bite (Strongbow Cider and Harp) may appeal to your sweet tooth....well, less bitter tooth anyway. Continuing with drinks from England, a Pimm’s is a summer favorite in London. Made with gin, a few liqueurs, and fruit extracts, Pimm’s was initially meant to be enjoyed with oysters when it was created in 1823. Now it is mixed with Sprite and sold as a refreshing alternative to beer. While Scottish beer is not available, one thing the Rose & Crown does carry from Scotland is its whisky. 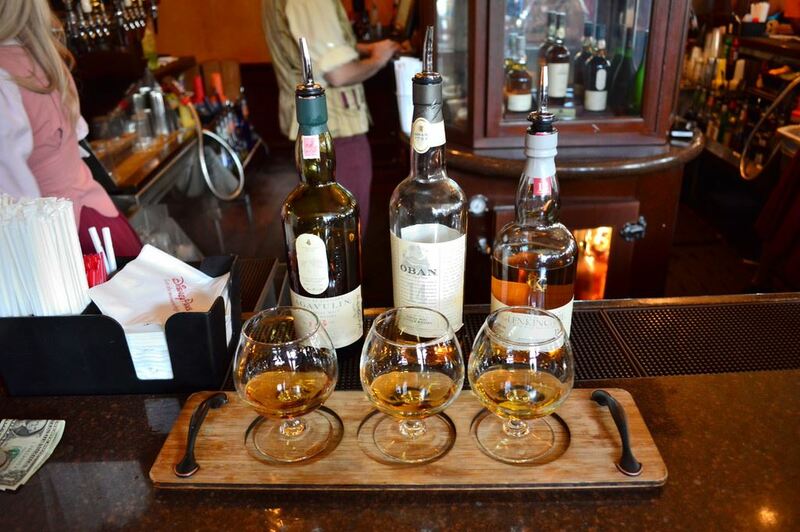 There are several varieties of Scotch available as well as two different whisky flights. If cocktails are your game, try a Welsh Dragon, a strong melon liqueur-based drink. A pub menu is also available, serving such hearty classics as fish and chips and bangers and mash. The food can be unremarkable here, but it is classic pub fare and there are no surprises.